Keeping traditions alive: Members of various tribes participated in indigenous dances, songs and crafts at the Chumash Day Powwow and Intertribal Day Gathering. “I think it’s important to know where we come from,” said Linda Gutierrez, who attended the powwow. Photo by Maria Barragan- Reporter. 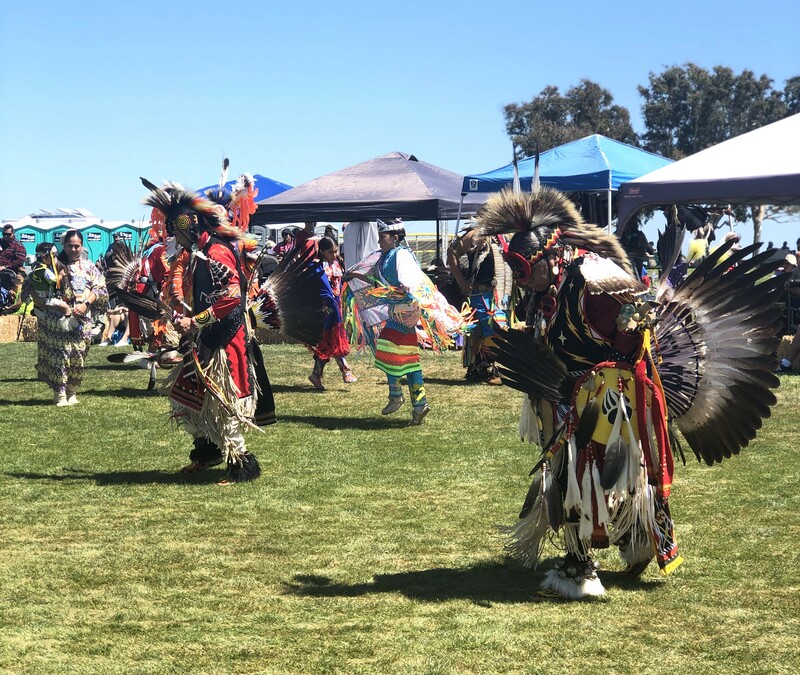 Hundreds of Native American tribes from around the country gathered at Malibu Bluffs Park on April 13-14 to join in festivities at the 21st Annual Chumash Day Powwow and Intertribal Day Gathering. Tribal members and Malibu locals alike watched traditional dances, participated in arts and crafts, listened to music, sampled from food trucks and enjoyed the sunny weather at the oceanside park, which is directly across Pacific Coast Highway from Pepperdine University. A powwow is a Native American ceremony involving feasting, singing and dancing. Although the tradition did not originate in California with local Chumash tribes, tribal members still gather to celebrate their culture, share their spirituality and reunite with tribe members who they have not seen in years. “The good thing about [powwows] is that a lot of the families that are here right now were brought here from the reservations because of the relocation programs. So most of our own families and descendents are currently living in the cities, and this powwow has given us the opportunity to gather and come together and socialize and share our dances with one another,” said Maxine Orozco, who identifies under the Pueblo, Apache and Pascua Yaqui tribes. Orozco said these events create cultural development. She said that through watching their elders gather and share their traditions, spiritual beliefs and values, the younger generation has become more integrated in their community. “We represent less than one percent of the population, and because it is so hard to keep our culture alive within our families, powwows allow us to support one another and network with one another. And the good thing about this is that the younger generation is now catching on to the language and the dances and the music,” Orozco said. Orozco also said the Malibu land where the event took place has special significance to Chumash tribes due to their spiritual origin story and relationship with the sea. Dressed in her colorful traditional Aztec wear, Linda Gutierrez of Los Angeles said it is important to continue passing down traditions and cultural knowledge. She emphasized the importance of knowing your cultural background, and continuing to practice those values in order to not lose the meaning behind the culture itself. “I like to be open-minded and know that we are not the only indigenous people out there. I think it’s important to know where we come from. I was blessed enough to have my mother put [me] into [the traditional dance] Folklorico from Oaxaca at a young age because it taught me about my culture and about myself, which was something I did not see coming from the other children I grew up with,” Gutierrez said. Sandra Logan of the Navajo tribe said during powwows, the Native American community wants to give back. Her and her immediate family gathered snacks and beverages to give out to tribal members as well as the public. The event was run like an extended family reunion, but was open to the public to attend for free. The City of Malibu offered free shuttle transportation to and from the event, a place for children’s arts and crafts and vendor stands that sold Native American spiritual and traditional items to the public.